Last week we finally met with our contractor, who did not make it out the week before to do the work like he had planned. We did decide to let him go ahead and build the cabinets on the fridge side. He is also going to do all the electrical work for us too. Hopefully we will be able to move the pantry, which would save us quite a bit if money. As of Monday he had not started the cabinets yet though. He is super busy and working us in. It is a little frustrating that progress has been so slow, but we are trying to stay optimistic. So this is what has happened since my last post. 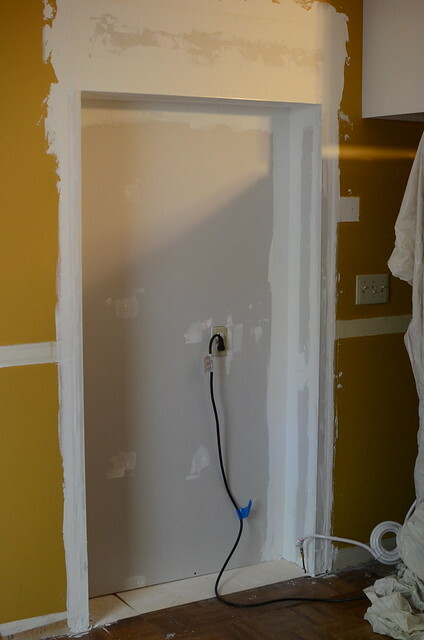 The electrical was moved along with the water line for the fridge. Then Mitch and his dad drywalled the opening. It still needs a final sanding, but it is pretty much finished. Mitch had a run in with a drill bit. The drill bit was sticking out of a board and he somehow managed to slice his finger all the way from bottom to top. He had to have 16 stitches. 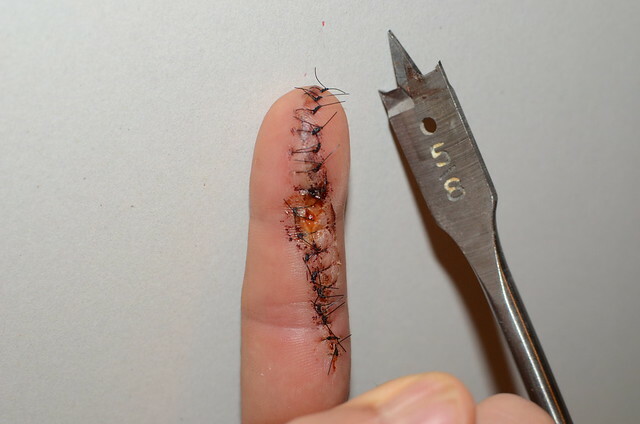 He should get the stitches out in the next few days, but he is still not able to bend his finger very well. I convinced him to take last weekend off to give his finger some time to heal. He's already planning what we will try to tackle next weekend, so it obviously hasn't slowed him down too much. Since our contractor is so busy, we are going to attempt to move the pantry next weekend. Wish us luck. I have been tweaking the blog a bit so if you read this in a reader or e-mail click on through to the website to check it out. I would love feedback. JEN! I'm so far behind - I LOVE the blog update! The header is adorable and it feels so nice and clean! It is going to be so fabulous when it is all done. Just keep reminding yourself of that.